RAMALLAH, West Bank (AP) — Palestinian officials say dozens of prisoners in Israeli jails have ended a hunger strike over phone privileges. CHICAGO (AP) — Outgoing Mayor Rahm Emanuel has agreed to create a partnership between technology and innovation ecosystems with the city of Chicago and an Israeli nonprofit. JERUSALEM (AP) — Israeli President Reuven Rivlin has begun consultations with representatives of the new parliament's factions ahead of tapping the country's next prime minister. JERUSALEM (AP) — The Israeli military says it's investigating the fatal shooting of a Palestinian man by an Israeli civilian earlier this month near the West Bank city of Nablus. GAZA CITY, Gaza Strip (AP) — Gaza's health ministry says Israeli troops have killed a Palestinian teenager during protests along the perimeter fence dividing Israel and Gaza. WASHINGTON (AP) — A founder of the Palestinian-led boycott movement against Israel was blocked from entering the United States in what he said was a "politically motivated" move. 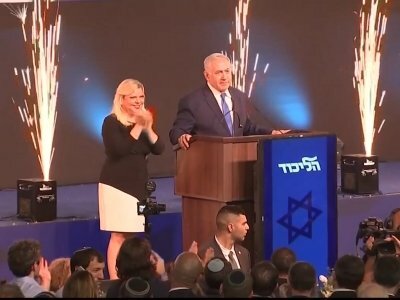 JERUSALEM (AP) — Prime Minister Benjamin Netanyahu's apparent election victory has deepened the divisions in an already-divided country.